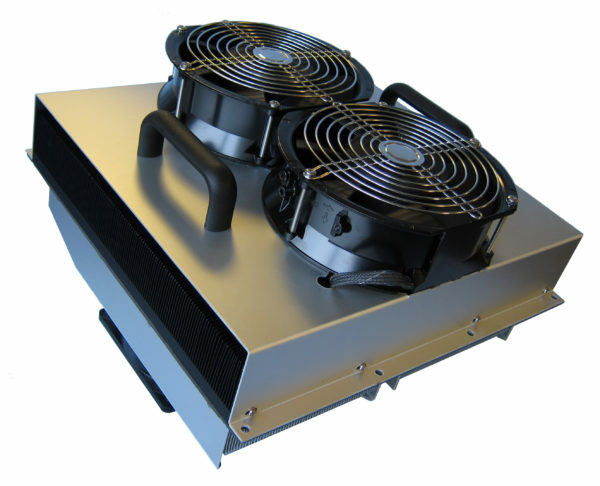 The AA-480 Outdoor Thermoelectric Cooler is an is an Air-to-Air thermoelectric assembly (TEA) that uses impingement flow to transfer heat. It offers dependable, compact performance by cooling objects via convection. The AA-480 has 480 Watts of cooling power and a COP = 1 at ΔT=0°C. Heat is absorbed and dissipated thru custom designed heat exchangers with high aspect ratio, air ducted shrouds and high performance fans. The heat pumping action occurs from custom designed thermoelectric modules that achieve a high coefficient of performance (COP) to minimize power consumption.